Both marine (sea) turtles and land turtles are in danger of extinction in some parts of the world. The Chinese value turtle meat both for expensive food and for making traditional medicines. As a result, turtle farms are very popular in China. Turtle farms in the United States also exist, for the purpose of exporting turtles to China. Wild turtles are also caught and sent to Asia. In some states in the U.S. it is legal to catch wild turtles and this is a profitable business. 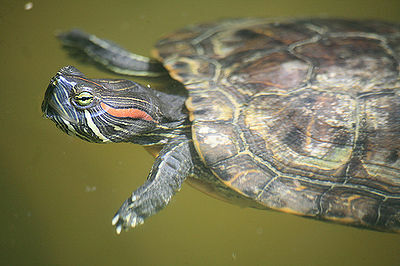 As many as 15 million turtles are traded annually in Asia. develop and promote turtle conservation efforts in Asia, It has been estimated that about 75% of Asia’s 90 tortoise and freshwater turtle species have become threatened. Organizations such as the Asian Turtle Conservation Network are working to develop and promote turtle conservation efforts in Asia. All seven species of marine turtles are endangered. The biggest threat to these turtles is commercial fishing. Turtle hunting is banned in many parts of the world, but turtles are often caught in nets and on hooks meant for fish and other sea creatures. This could be fixed through the use of nets from which turtles could escape and larger hooks. Attempts to exploit offshore oil and gas reserves pose a serious threat to marine turtles. These reserves destroy the turtles’ foraging and nesting habitats. Oil spills, such as the recent BP oil spill, are a grave danger to turtles as well. Poaching of turtle eggs is also a concern. Turtle eggs are considered a delicacy and are often stolen from nests. Human presence on the beaches and in the ocean pose dangers to turtles as well. Garbage which makes its way to the water can be ingested by the turtles. The plethora of people and equipment (such as beach umbrellas and chairs) on the beaches drives away nesting turtles. Beach cleaning, adding of sand and erosion are all harmful to turtles as well. Some beaches where turtles nest are being protected from human development. Some organizations dig up turtle eggs and relocated them away from human traffic. Artificial lighting from buildings, streetlights, and beachfront properties disorients turtles. Baby turtles find the ocean by walking toward the natural light reflected off of it. Artificial lighting also prevents female turtles from nesting and may cause them to mistakenly move inland after egg laying. In order to make your voice heard, e-mail or write to public officials. It costs little or nothing and can have a great impact. Donate money to sea turtle conservation projects or, if you live near a beach, donate your time for beach monitoring. If you don’t live near a beach, you can adopt a turtle by donating the funds to protect it.